_In Bridge Troll, you and your friends are hideous trolls who each guard a troll bridge. Each turn, you throw boulders to bid for travelers, who vary in number depending on the weather for that day. Travelers include fat merchants, pilgrims, poor monks (who make good eating), and if you are lucky, royal personages. As travelers come to your bridge, you use them to collect tolls. But watch out! Knights, bandits, dragons, and vicious Billy Goats Gruff prowl the countryside. You'll have to use some of your boulders to chase them away (which means you’ll have fewer left to use on your bridge!). Although you need to collect tolls from travelers so you can buy building supplies, working on your bridge makes you hungry, so you will have to eat some of your travelers instead. It is important to balance tolls with food in order to make your bridge very appealing to travelers. If you eat too many travelers or just collect money, you won't be able to fix up your bridge. The player who uses toll-money, food, and boulders to build the most impressive troll bridge operation wins the game. Jonathan Liu of GeekDad / WIRED Magazine reviews Bridge Troll here. Confused about any of the rules in the game? See here for answers to Frequently Asked Questions. 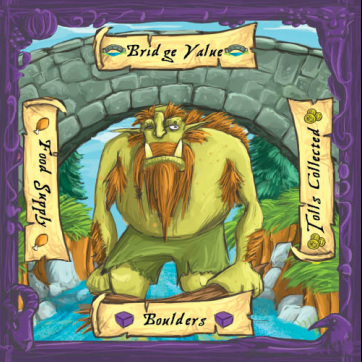 The Board Game Family has posted a four star video review of Bridge Troll here. Bridge Troll was named as a Top 10 game of 2009 by the Dice Tower's Giles Pritchard. Bridge Troll was a Top 10 finalist in the Australian "Best International Game" Awards. Bridge Troll was a nominee for Best Family Strategy Game in the Games Magazine "Games 100" for 2010. The gaming blog 'Troll in the Corner' interviewed me and artist Ryan Laukat here. The Deseret News wrote up a very nice piece on the release of Bridge Troll. Click here to see photos from the release party at Game Night Games in Salt Lake City.